To most of us, learning something 'the hard way' implies wasted time and effort. Good teaching, we believe, should be creatively tailored to the different learning styles of students and should use strategies that make learning easier. Make It Stick turns fashionable ideas like these on their head. Many common study habits and practice routines turn out to be counterproductive. Underlining and highlighting, rereading, cramming, and single-minded repetition of new skills create the illusion of mastery, but gains fade quickly. More complex and learning come from self-testing, introducing certain difficulties in practice, waiting to re-study new material until a little forgetting has set in, and interleaving the practice of one skill or topic with another. 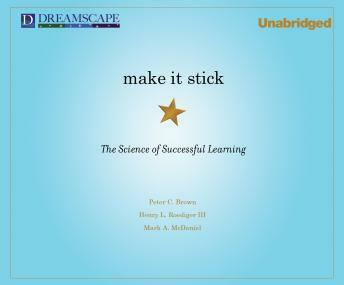 Speaking most urgently to students, teachers, trainers, and atheletes, Make It Stick will appeal to all those interested in the challenge of lifelong learning and self-improvement. Love this book. Lots of good information. We really need to use these practices in public education. Loved it. Very helpful and comprehensive! The structure of the book embodies the very principles the book teaches (clever), and by the end you really get a strong sense of the ideas and applications.